When our compost got too big, we had to do something about it. Last month, our gardener cleared the area, and scattered the lovely soil around our garden. We were left with a very large, cleared, sloping area. This was left to settle for some weeks and in that time weeds began to spring up. We had had several plans in mind as to what to do but they all would result, we knew, in weeds appearing sooner or later, and we definitely didn’t want more work in the garden. Jokingly I suggested artificial grass, and was very surprised to find my idea taken seriously. 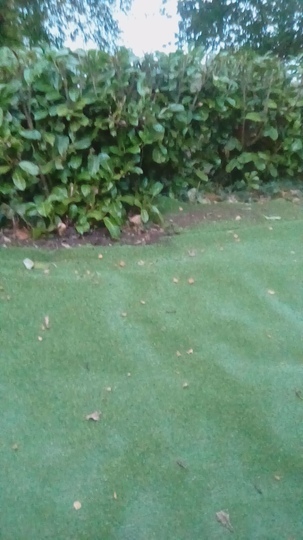 From Grass Direct we bought some artificial grass in their clearance section and this week, our gardener and my husband laid weed-suppression membrane over the whole area and artificial grass on top. Yes, real grass would be better, but at our age we don’t want work! Purists may not approve , but for now we have instant ground cover and the area looks tidy. I hope you agree! it doesn't matter what anyone else thinks. if you like it that is all that matters and as you say it is for ease of maintenance. I think it looks very effective. Looks fine, and you won't get dandelions, which has got to be plus! Just don't forget and try to plant a shrub in it! It’s in an area where few people will see it and might put the deer off! Yeah..who cares what anyone else thinks. If it works for you...good job! I wonder if the deer will try to eat it ? Doubt that, Diane. They go for their favourites! I dont know much about Deer, will shut up. Had to laugh at your comment, Diane! Stera: As children, we used to feed sweet papers to a Billy Goat . Hope we didn't give him tummy ache. LincsLass: There are some leaves scattered on it now and it looks quite realistic. A vast improvement on the very large compost heap we had there. Quite pleased with that area now.